As noted earlier, this “weekly” blog will be less frequent while I am writing a new local history book. 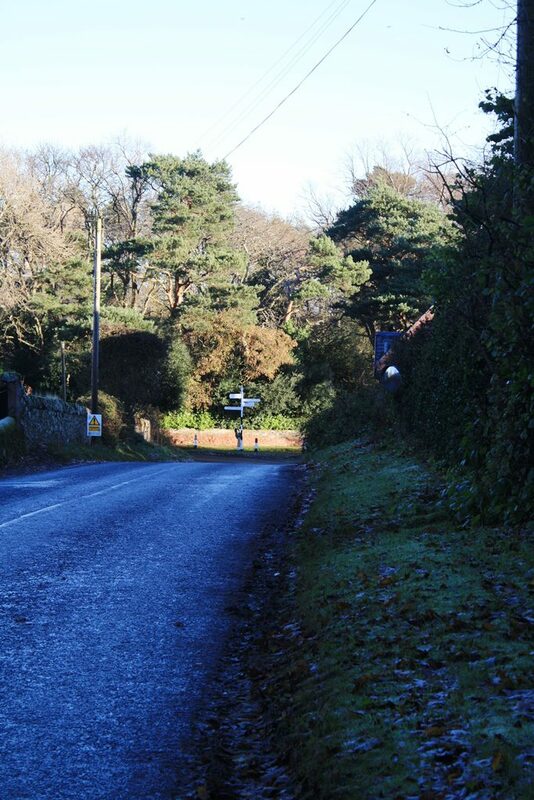 I was out on my bike last week cycling past the village of Stenton which was featured on the blog recently. 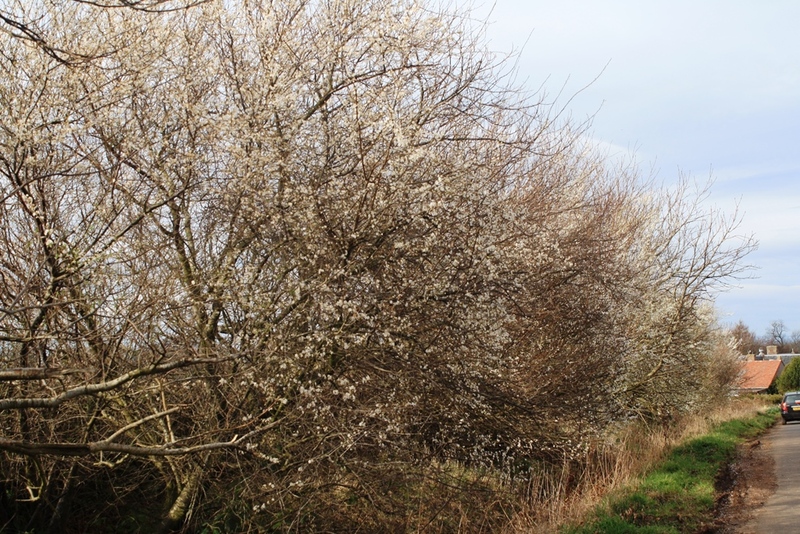 The blackthorn bushes (good photos) are now in full blossom on the road out of the village going west towards Pressmennan Lake, and passing Ruchlaw Mains West farm (good photo), where there’s a steep hill. 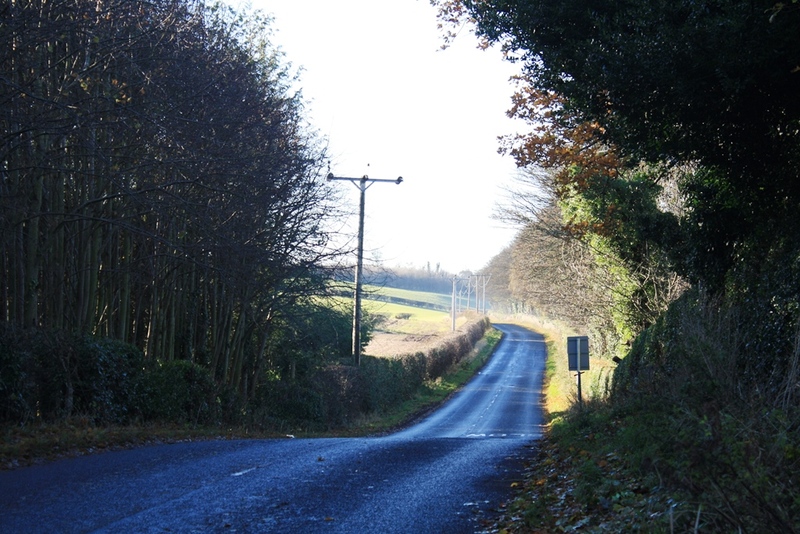 It is one of these deceptive hills in that you think you are at the top when you see the sign to Pressmennan Wood and lake (good photos), but there is a nasty further climb as you veer right. It is always a relief to get to the top and look over the rolling fields. After another short climb, I came across two fields that were strewn with sheep and very young lambs. The sun was on the fields and it was an entrancing rural sight, like something out of the Far from the Madding Crowd book and film. 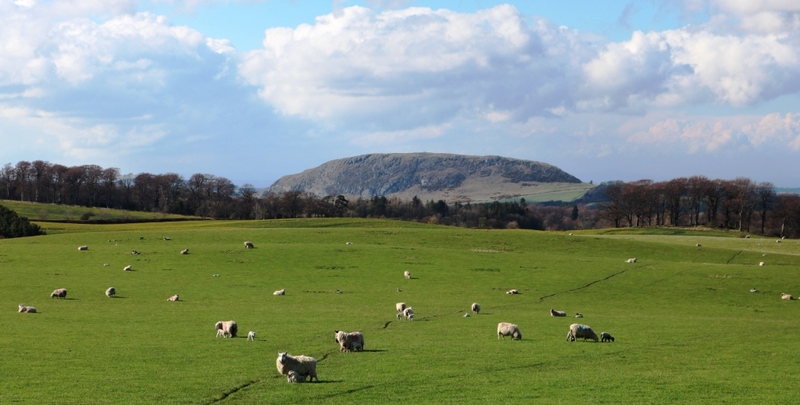 The first photo shows the sheep and lambs scattered across this field and in the back ground is Traprain Law (good photos). The ewes were very aware of my presence even although they were not close to the fence surrounding the field. the lambs meanwhile seemed more intent on suckling than looking at this passing photographer. The next photo was taken in the field opposite, which is at the bottom of a hill and beyond the sheep, you can see the foot of the hill which is extensively covered in gorse bushes. The gorse at this time of year provides a welcome splash of yellow, but it is an invasive species and needs to be controlled. Close up, while the yellow flowers of the gorse are attractive, it is still a very thorny and aggressive pant. The other noticeable aspect of this photo is the numbers on the back of the sheep and each lamb is also numbered, to link it to its mother. Presumably this is for the shepherd who finds a stray lamb and who can reunite it with its mother. Alternatively, it may be that East Lothian has numerate sheep. 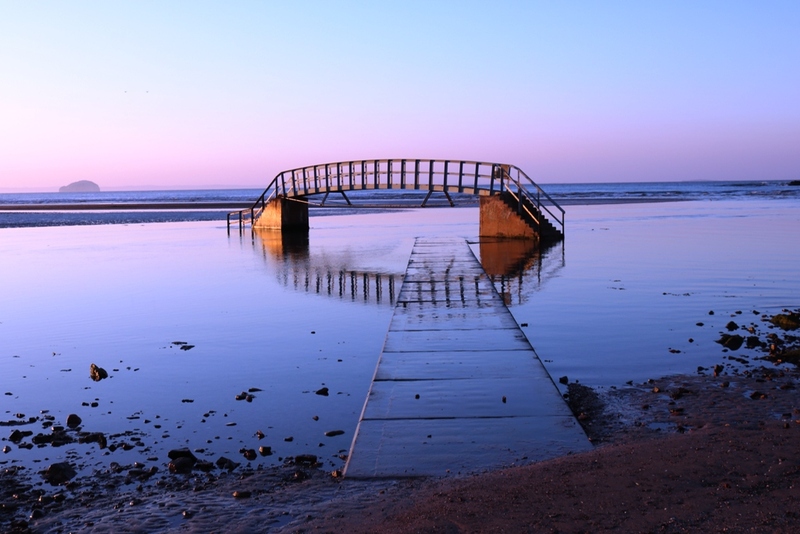 The bridge at Belhaven Beach has been widely photographed and has featured on the blog more than once. 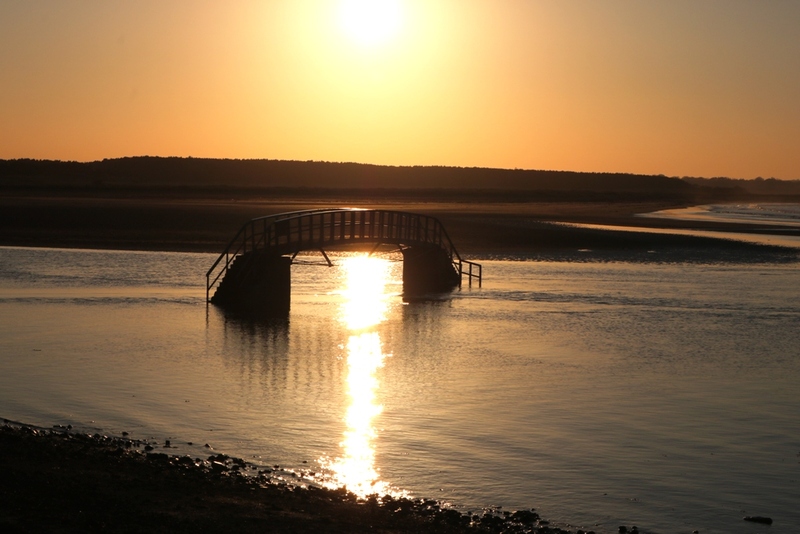 I have tended to take photos of the beach in September, when the setting sun shines over and under the bridge. Last week, we went for a short postprandial walk along the beach when the tide was just going out. 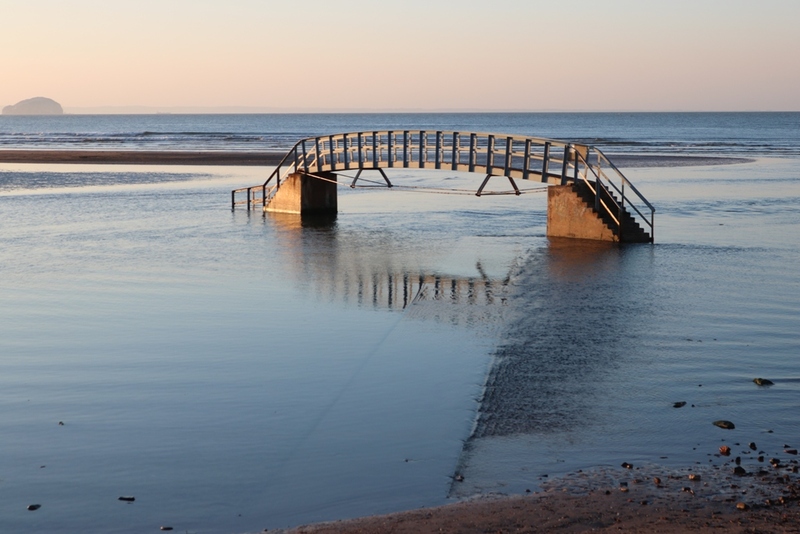 The bridge, when the tide is in, is referred to as the bridge to nowhere, and you can see why in the photo below. 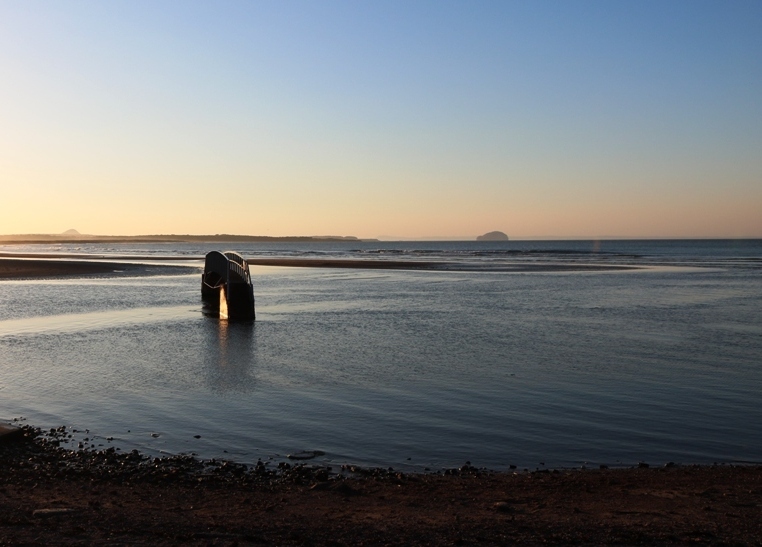 The bridge is surrounded by water and on the horizon to the right, looking distinctly snail-like, is the Bass Rock on which 150,000 gannets will soon be living. The next photo was taken as we passed the bridge, walking along the beach towards the south and you can see the line of the concrete path to the bridge just appearing as a line to the left of the right hand base of the bridge. When we returned only a few minutes later, the path could be clearly seen, so the tide was going out very quickly. In this photo, the reflection of the bridge is quite clear, but to the naked eye it was just a shimmer in the water, as the bridge reinvented itself upside down in the evening tide. The final photo shows the sun coming under the bridge and this is a wonderful sight, as if the water is being turned into molten gold, which if it solidified would make a solid gold pathway under the bridge. 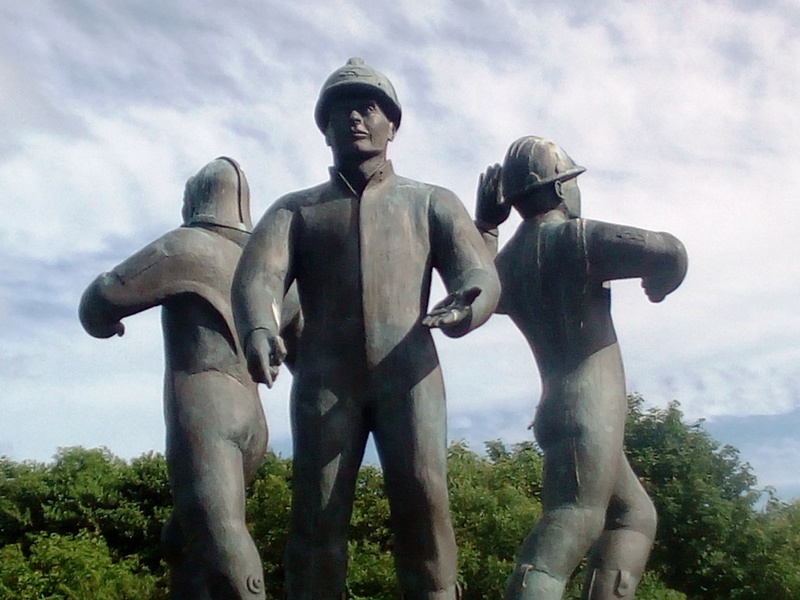 The origins of the bridge are currently being investigated by the local history society. A delay in the blog due to visiting rellies, local history talk and a grand day out with my former (but never old) classmates Tam and Nigel. 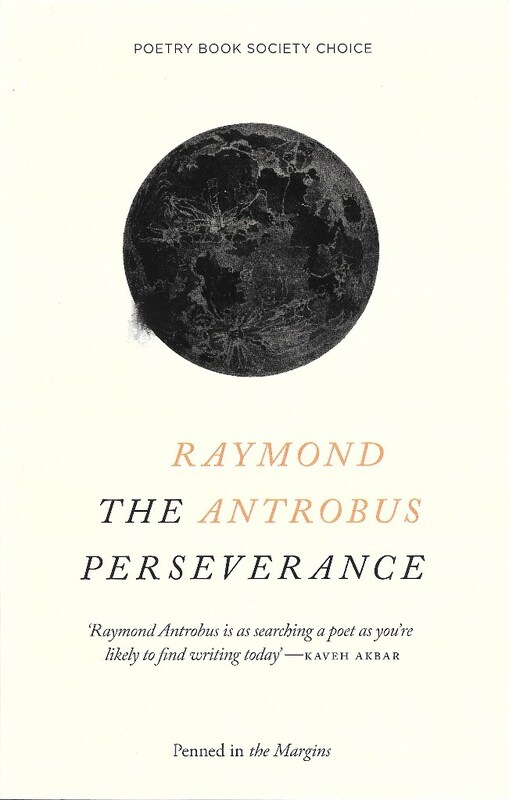 I’ve just finished reading the latest Poetry Book Society Choice, Raymond Antrobus’ The Perseverance. The young poet Raymond Antrobus is described as British-Jamaican and part of the book is an elegy to his late father. The other distinguishing feature of this remarkably assured debut collection is Antrobus’ reflections on his experience as a child and young adult who was deaf at birth. The first poem is Echo and begins “My ear amps whistle as if singing/ to Echo, Goddess of Noise,/ the ravelled knot of tongues,/ of blaring birds, consonant crumbs/ of dull doorbells, sounds swamped/ in my misty hearing aid tubes”. It is obviously impossible for a person with normal hearing to imagine being deaf, but these lines gives us a vivid description of what it might be like. Antrobus’ precision with words e.g. “ravelled knot”, “consonant crumbs” or “misty” makes you read the lines again, to get the full effect. Part of the book is an anguished cry about what he calls the d/Deaf experience and how deaf children have been treated unequally because of their difference i.e. not disability e.g. “I call you out… for assessing / deaf students on what they can’t say / instead of what they can”. The title of the book The Perseverance refers to the name of the pub the poet’s father used to leave him outside as a child and “watch him disappear / into smoke and laughter”. His father tells him “There’s no such thing as too much laughter” after visiting the pub, but the poet notes that this may be true, “unless you’re my mother without my father”. The father may be flawed (and who is not?) but is mostly a loving and patient father, especially when reading to his deaf son. Antrobus has a wonderful facility for creating emotion with words. Referring to his father’s late dementia, he thanks the syndrome for bringing back memories of the past to his father, such as the dance halls he enjoyed. “When his sleeping face / was a scrunched tissue / wet with babbling, / you came, unravelling a joy / making him euphoric” and he asks dementia to ” do your gentle magic / but make me unafraid / of what is / disappearing”. Antrobus is a young poet and his second collection will be expectantly awaited. The previous post featured snowdrops, and as Monday follows Sunday, the crocuses follow the snowdrops with a blaze of colour, as if determined to outshine their plain green and white predecessors. 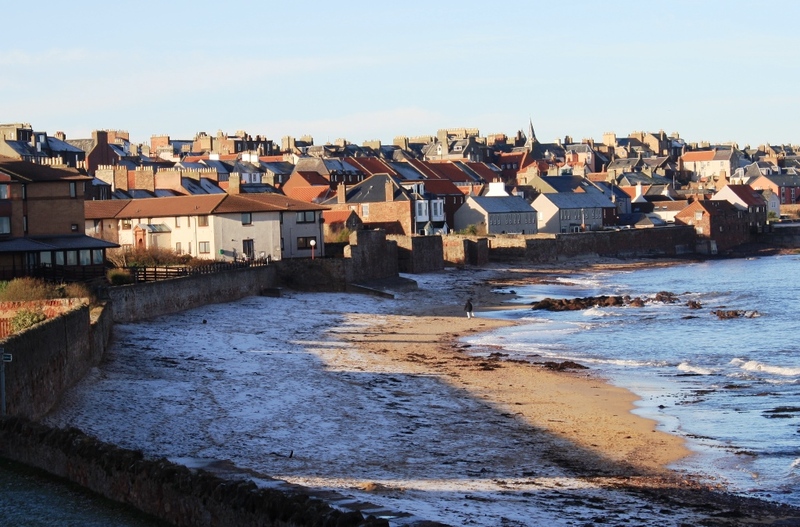 Out on the bike, I often cycle through the bonnie village of Stenton which is about 6 miles/ 10K from Dunbar, away from the coast to the foot of the hills. There are two extensive groups of crocus in the village. 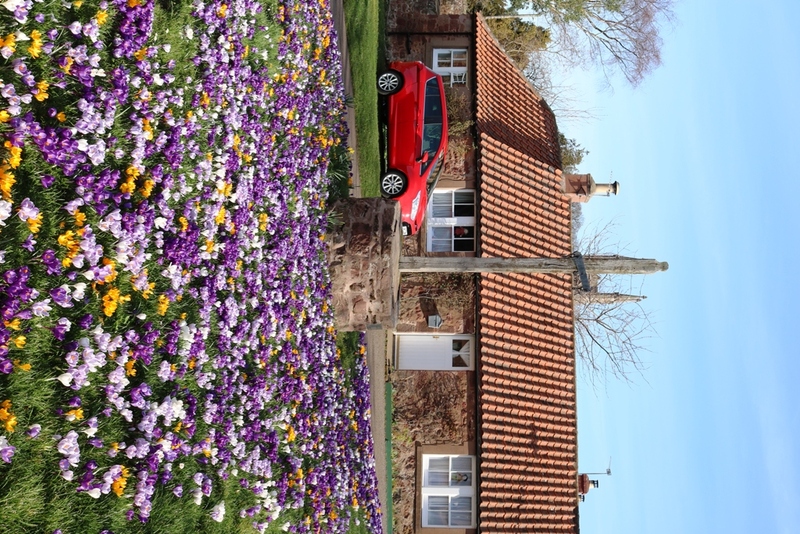 The first photo shows the spread of different colours in the flowers, with a stone cottage in the background and the church spire just above the cottage. The next photo shows the spread of crocuses beneath The Tron – a wooden beam with an iron crossbar and hooks on either end. This device was historically used to weigh bulk items such as wool and grain in the markets which used to be held in the village. 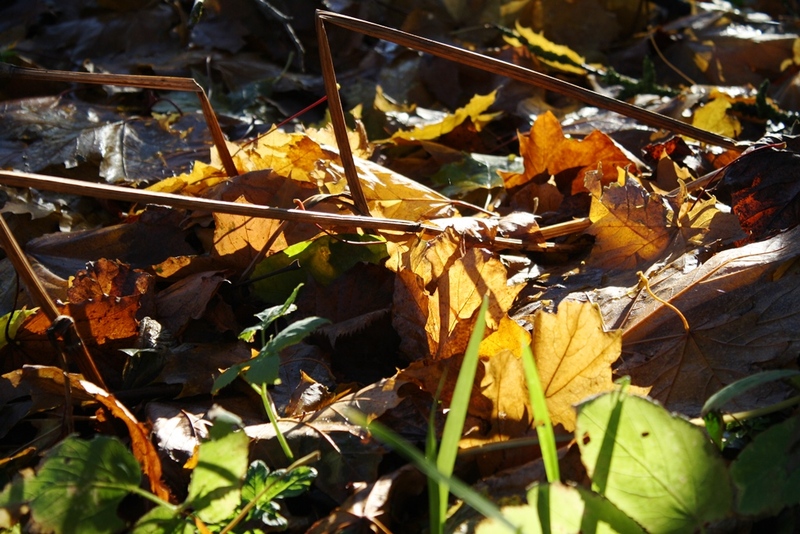 The word tron is derived from the French word for balance – more information here. 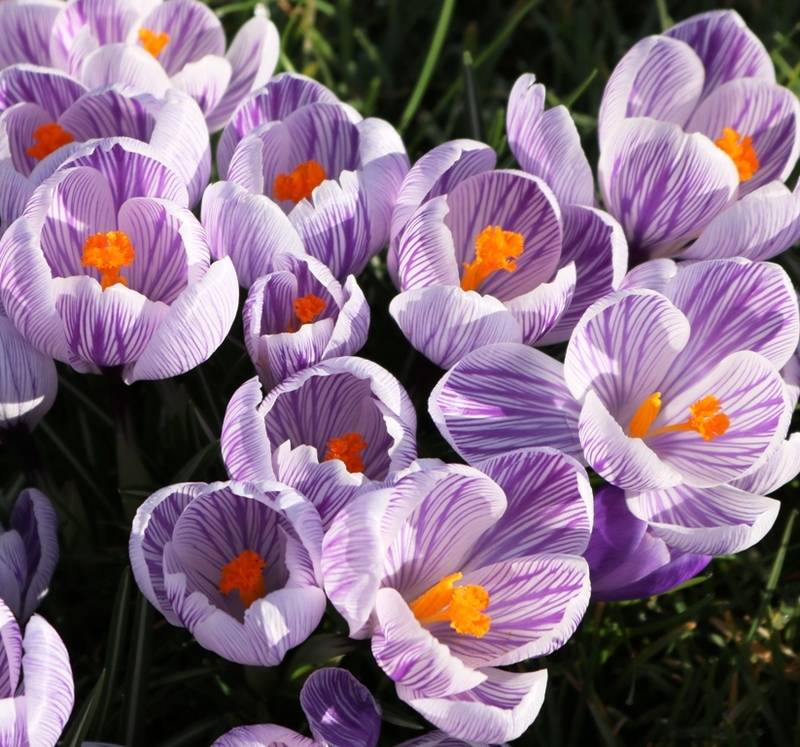 I took a number of close-up shots of the crocuses – you can also refer to croci as crocus is a Latin word, albeit derived from the Greek krokos – to get a better view of their strength of colour along with the delicacy of their flower heads. 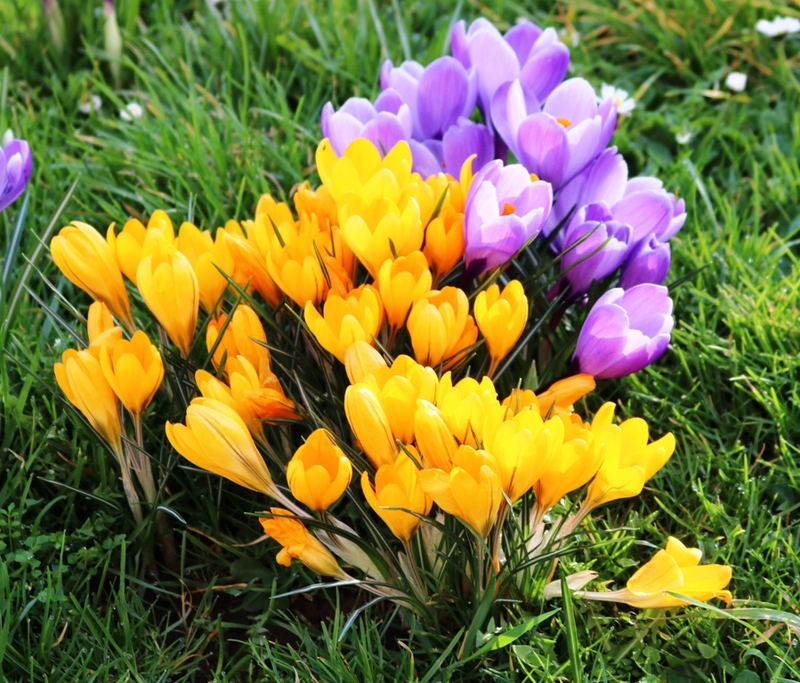 The first photo shows two groups of crocuses, one yellow and one purple. They complement each other and are shown off to good effect by the green of the grass beneath them. 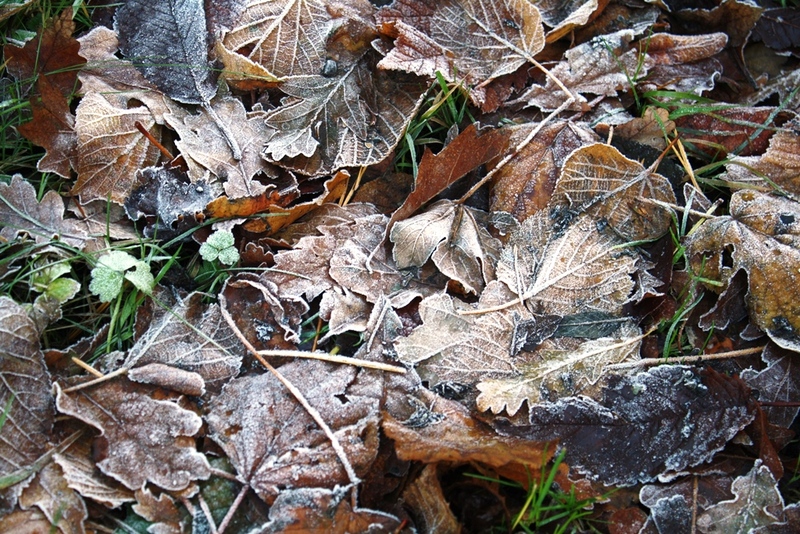 When the crocuses first start to appear, it is their own greenery – hiding the emergent flowers – which shows first and they can be hard to spot. Then, all of a sudden it seems, there is a huge outbreak of colour. 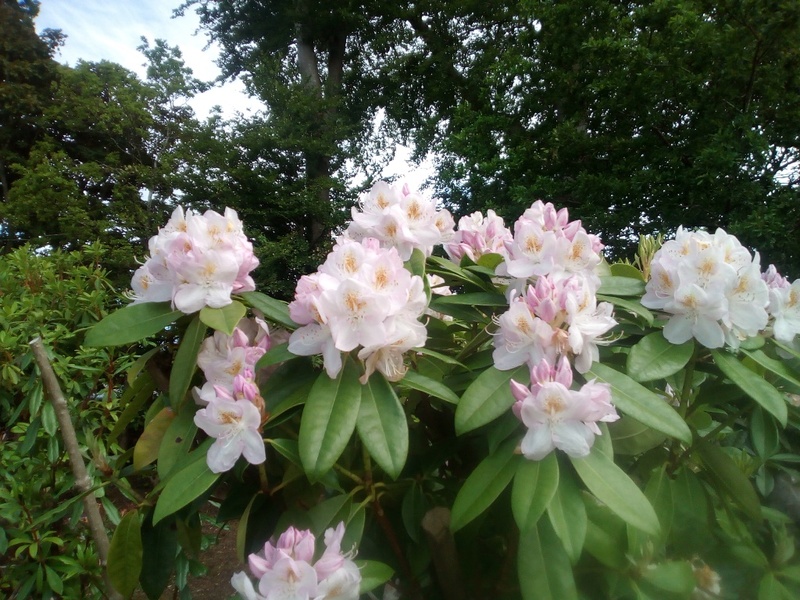 On closer inspection, in the photo below, you can see the bright orange stigma reaching out to attract the bees and other pollinators. 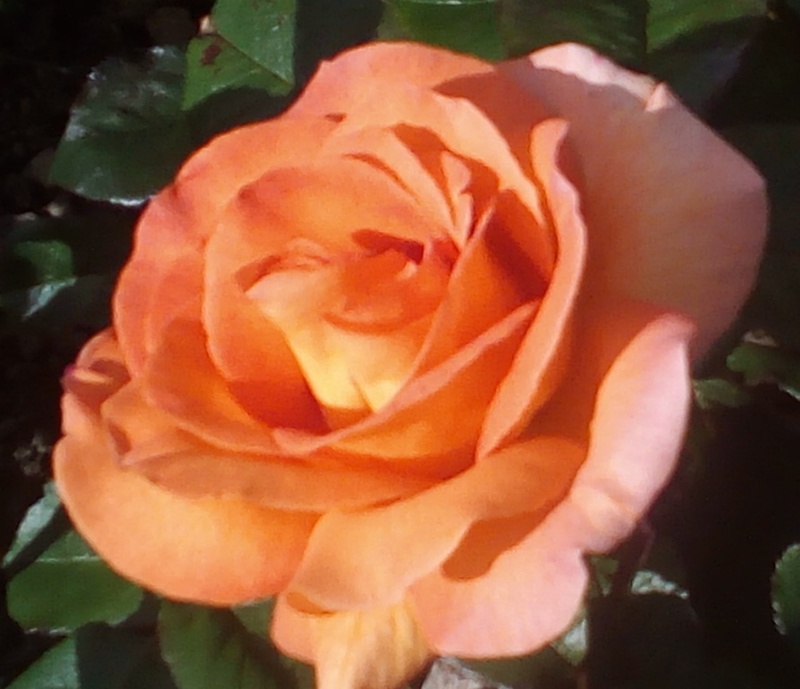 What is more attractive is the David Hockney like lines inside the flower. 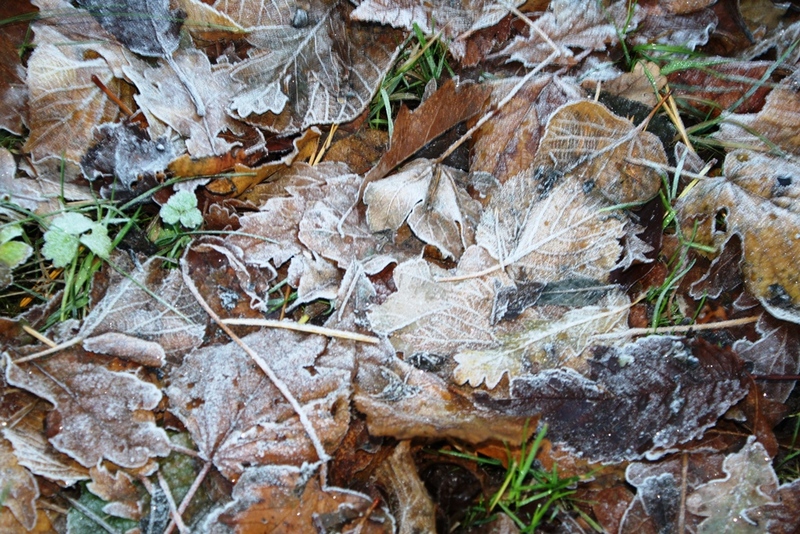 These thin and thicker purple lines resemble images of trees in winter. Walking past this group of crocuses, you might never see these patterns. 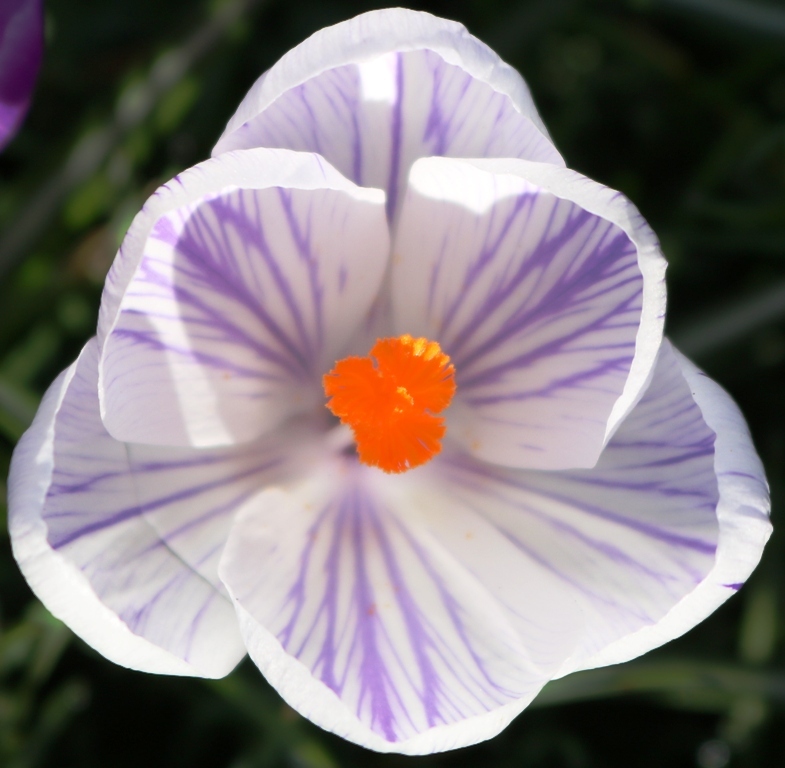 In the next photo – of one crocus – the lines are even more delicate and the sun shining on part of the flower head adds to it beautiful shape and patterns. 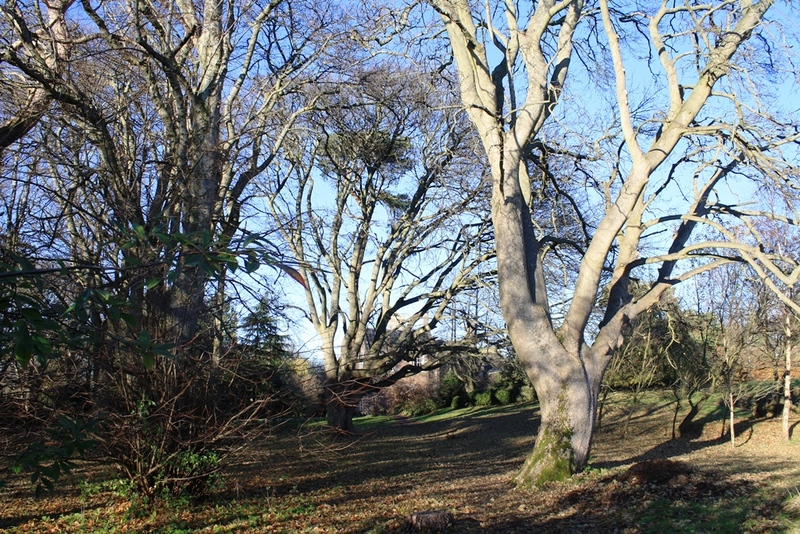 I then went along to the village green to see the other natural display – another outburst of colours on the grass and between the trees. 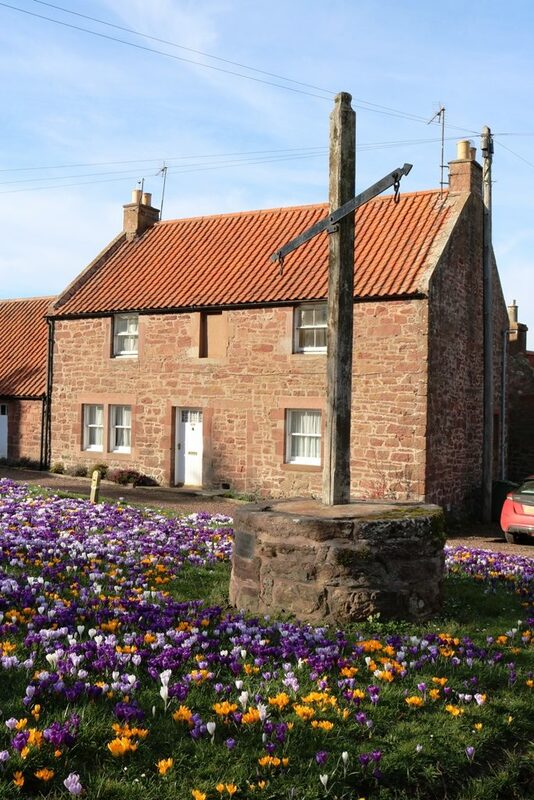 The final photo shows the sweep of the crocuses, the colour enhanced by the bare trees, and the solid stone cottages, of which there are many in this very attractive East Lothian village. A delay in the posting of this blog as I’ve been in hospital for the past week after a bizarre accident. I tripped and fell down the steep slope of our back garden while bringing in the washing and toppled over the 1.5m wall at the bottom of the garden. I broke 10 ribs and punctured a lung. I was rescued by golfers leaving the nearby golf course and some neighbours and taken to Edinburgh Royal Infirmary where I was treated by world class staff in the High Dependency unit and the Cardiothoracic ward. The attention and care given to me were truly outstanding and a real credit to the often criticised National Health Service. It’s a strange experience being in hospital as (in my case) you are taken there and transported into a totally different environment. Suddenly, your world shrinks to a hospital ward and you are severely restricted in your movements. You lose your privacy, your ability to make decisions (mostly) and cook for yourself. You spend your day in your pyjamas and slippers but it all seems natural, as your key concern is to lessen the pain. So, a few weeks to fully recover and get back on my bike again. I’ll get there. Before the trauma, we drove up to the village of Stenton to take photos of the hawthorn trees which are just coming into flower. 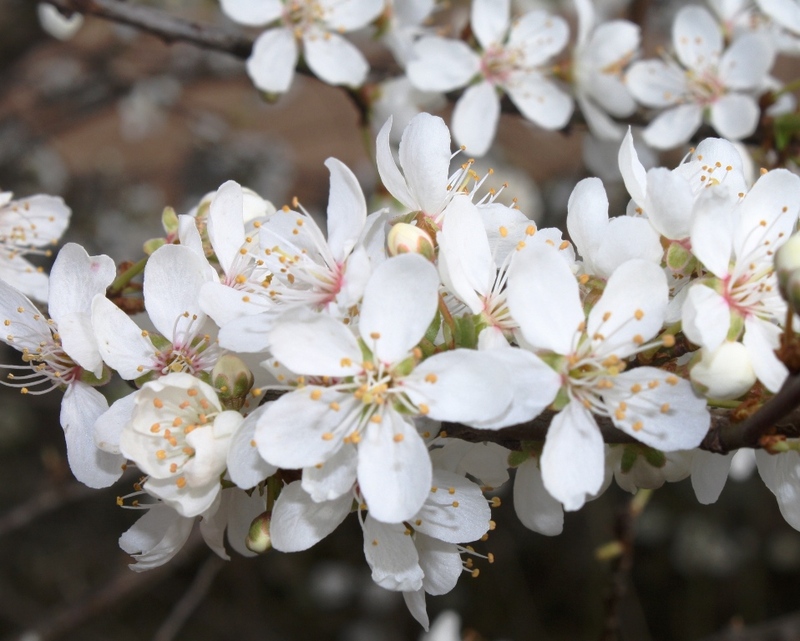 The hawthorn tree is very common in the UK but it at its most spectacular when the blossom arrives in the spring. Around here, the trees are referred to as haws although strictly speaking, this refers to the berries which appear later in the year. Siegfried Sassoon refers to the tree in his poem The Hawthorn Tree and writes “I know my lad that’s out in France/ With fearsome things to see /Would give his eyes for just one glance/At our white hawthorn tree”. 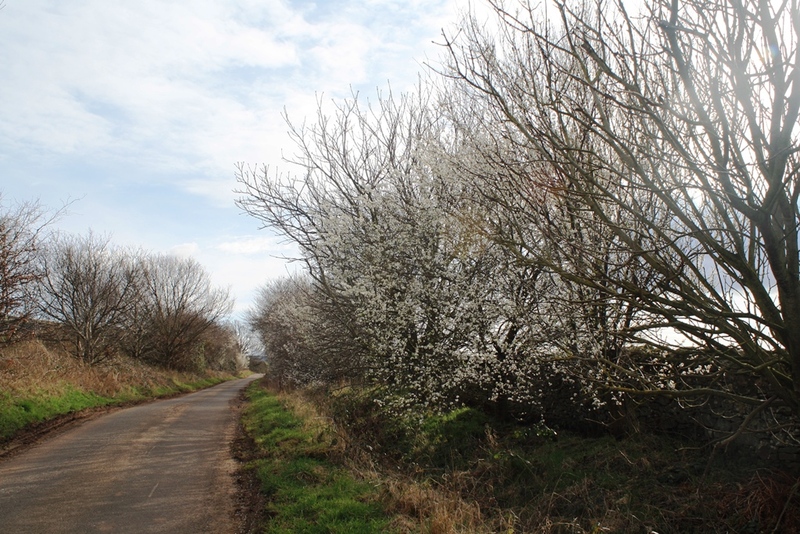 The photos below show the lane in Stenton where there are numerous hawthorn trees and also a close up of the blossom. 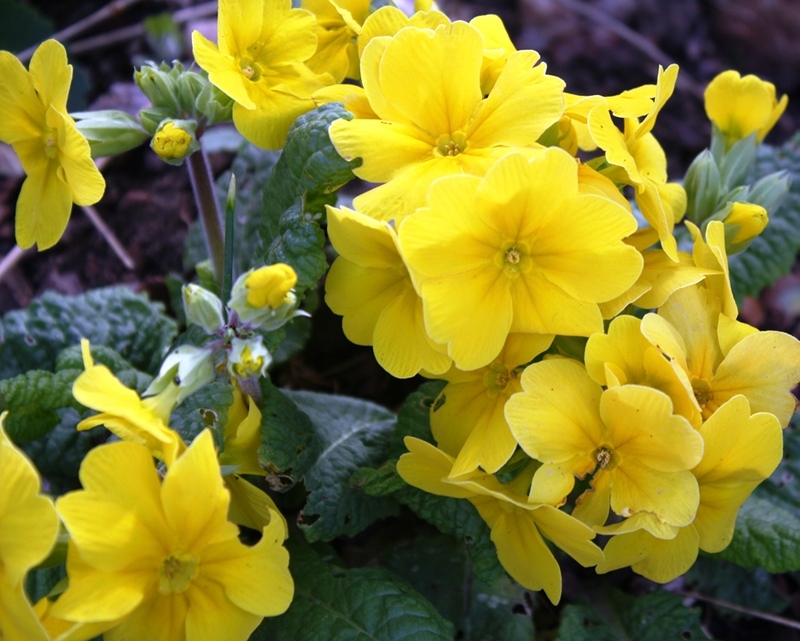 My garden has come into full spring colour again with a lovely spread of yellow daffodils but these are outshone by the polyanthus and primroses. 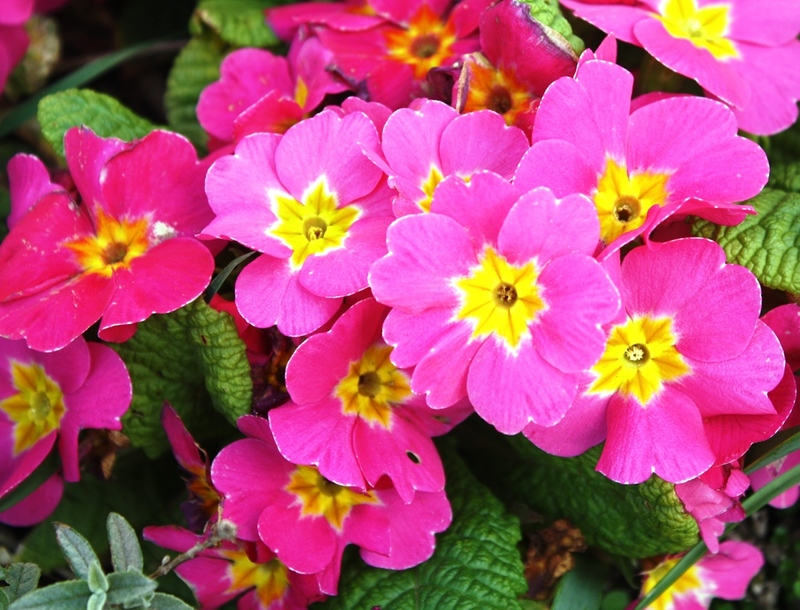 These two plants look very similar but there are differences, outlined in this article. 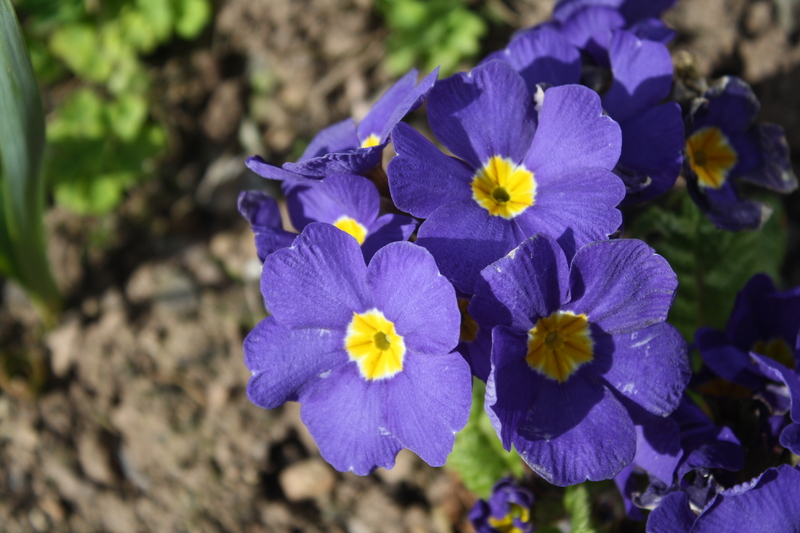 The following photos are of polyanthus although I think that the second one could be a primrose. On my bookshelf is Alice Oswald’s wonderful book Weeds and Wildflowers which has exquisite greyscale etchings by Jessica Greenman.The poem Primrose begins “First of April – new born gentle./Fleeting wakeful on a greenleaf cradle./Second of April – eyes half open,/faint light moving under the lids. 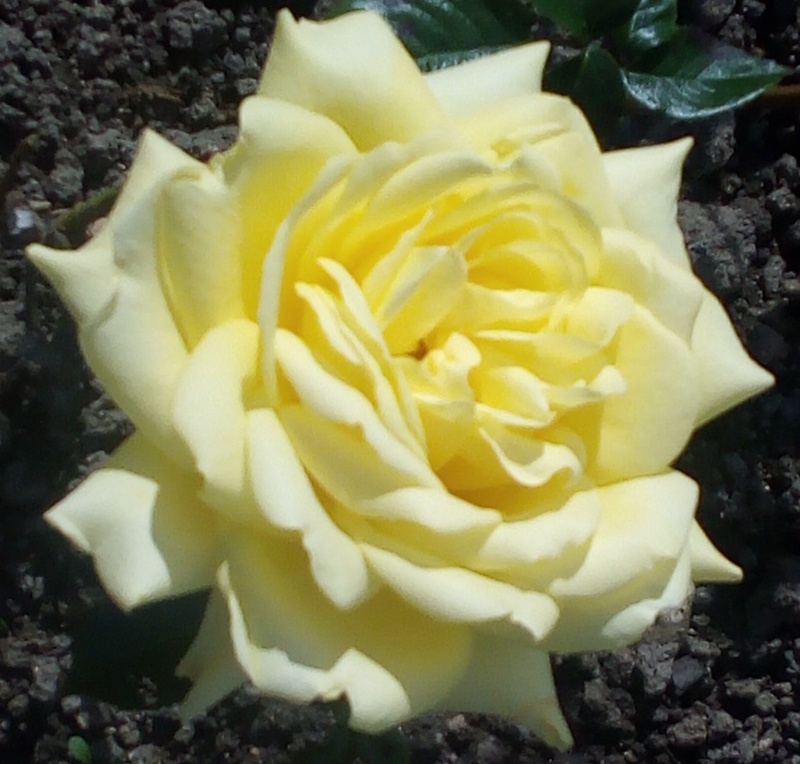 Face hidden./Third of April – bonny and blossoming/in a yellow dress that needs no fastening”. I’m writing this on 1st April, so a nice coincidence. You might look at the third photo differently now.